Jenny Ban Creates: Woo hoo for Washi Tape! Woo hoo for Washi Tape! Whether you love washi tape like I do, or have never seen it in action, here is a taste of what my classes have in store this month! I still have slots open for Wednesday night, June 20 at 7 p.m. and Saturday, June 23 at 10 a.m.
For $25 you can join me to make FIVE projects and take home TWO brand-new rolls of washi tape to play with on your own. We will be making two great cards, a votive holder, a notepad and pencil set, and magnets. 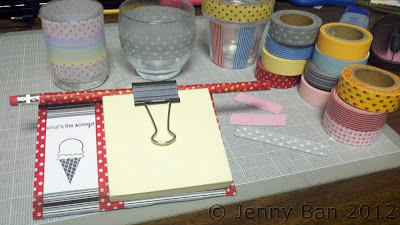 Washi tape is fun and easy to use. It is also economical and you can make some great gifts or party favors with it. Email me today to register! Don't forget, in addition to the A Muse Studio monthly spotlight, we still have ALL satin ribbon at 20% off. It is a great time to order!